BALLS is an opera composed by Laura Karpman, about the tennis great Billie Jean King. BALLS was chosen for The Industry’s FIRST TAKE workshop program, founded by Artistic Director Yuval Sharon. The video design was created using hand drawn animation over retro tv commercials and found footage of the tennis match between Billie Jean King and Bobby Riggs, as well as animating elements of 1970's print advertisements. Women Who Score: Soundtracks Live at Grand Performances downtown LA, presented in partnership with Alliance for Women Film Composers, to celebrate the music of women composers in film, television, video games and interactive media. As video producer and designer, I created multimedia videos to highlight the work of 20 female film composers using found footage and original animation. Siren Songs is a 3 part multimedia live performance commissioned by The Pacific Symphony, written by Emmy and Grammy-winning composer Laura Karpman. I created the videos using hand drawn animation, watercolors, lithographs, incorporating text from Amy Gerstler's poetry and underwater footage provided by Greg Macgillivray. The first movement is representative of the seductive and beautiful sirens of the sea; the second movement is evocative of Diana Nyad’s courageous swim from Cuba to Florida; and the third is a tribute to Dr. Sylvia Earle, a female scientist dedicated to saving the oceans. 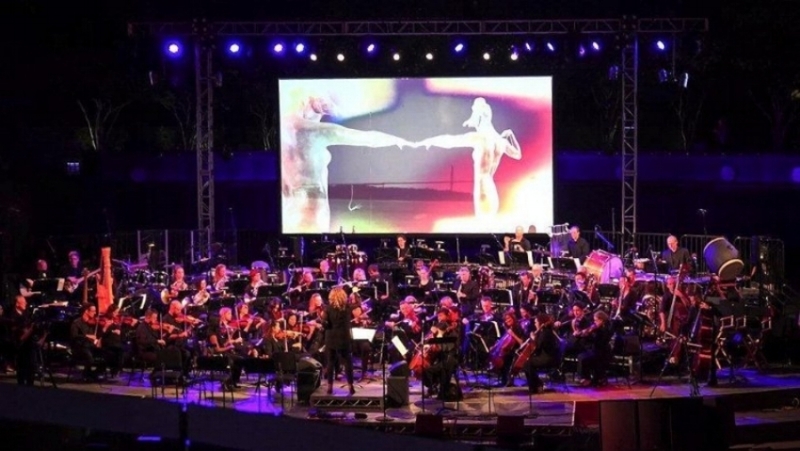 The video was triggered live using Resolume, keeping the visuals in sync with the Pacific Symphony Orchestra.